Italy felt hard done by. 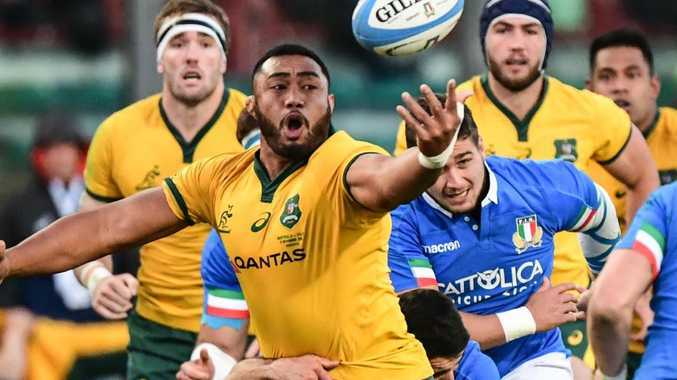 AUSTRALIA have eased the pressure on coach Michael Cheika - for now - with a hard-fought, though at times unconvincing, 26-7 win over Italy in Padova. 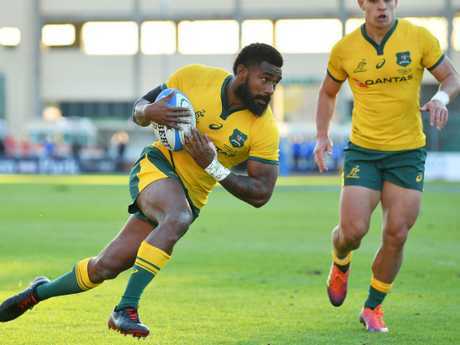 Under fire following last week's meek attacking display in the 9-6 defeat to Wales, the Wallabies ran in four tries to seal an 18th successive victory over the Azzurri. It also marked the first time in 11 years the Wallabies have conceded less than 10 points in consecutive Test matches. However, the win may have come at a cost with David Pocock leaving the field early in the second half with a "stinger" that could potentially rule him out of next week's clash with England at Twickenham. "He's obviously got a pretty nasty stinger on his neck," Cheika said after the match. "It was giving him the burns down the arm for quite a while. "We'll just wait and see what happens and see how he recovers over the next couple of days." Italy gave the tourists early notice of their intentions to end their woeful record against Australia by coming racing out of the blocks. Only a gang tackle centimetres from the line denied Italy No. 8 Braam Steyn from opening the scoring in the seventh minute after Tommaso Benvenuti had waltzed through the Wallabies defence and chipped the ball forward. The hosts were then left fuming three minutes later when debutant halfback Jake Gordon's wayward pass was intercepted by Tito Tebaldi, who ran the ball under the posts, only to have the try controversially called back by Pascal Gauzere for being offside. It was harsh on Italy, who were the superior side in the opening half-hour, and coach Conor O'Shea unloaded on Gauzere for not consulting the third match official (TMO) before making the call. "You have to be very careful in choosing your words because my wife would be pretty annoyed if I got fined, and we don't have that sort of money leading up to Christmas," O'Shea said after the match. "I just want the same rules for both teams. "We just want consistency. Consistency at the breakdown, so there's not one rule for one, and one for another. "For the life of me, why you don't go upstairs when it's there, is just beyond belief. It is beyond belief." The close call finally sparked the Wallabies into action and they clicked into gear and opened the scoring with their first decent attack. Samu Kerevi made a strong break out and switched the ball to Adam Ashley-Cooper who in turn found the onrushing Pocock in support. With blue shirts closing in, the No. 8 slipped the ball to Marika Koroibete who touched down under the posts. Marika Koroibete scored a double. The former NRL winger scored his second try just before halftime after good work from Ashley-Cooper with Matt Toomua again adding the extras. The second half saw the tourists extend their lead just after the restart when "Tongan Thor" Taniela Tupou barrelled his way over the line after interchanging offloads with Jack Dempsey. But the hosts hit back when Mattia Bellini scooped up a loose pass from Bernard Foley and sprinted 50m to get his side on the scoreboard. That try bolstered the hosts' belief as they laid siege to the Wallabies' tryline. However, the tourists withstood wave after wave of attacks despite having 14 men on the field for 10 minutes after Scott Sio was yellow carded for a deliberate knock-on. That outstanding effort on their own line was rewarded late in the game when Will Genia, in his 99th game in Australian colours, darted over from close range.